Creating the backyard of your dreams means putting some thought into the hardscape design. You might be asking yourself, "What is hardscape design?" So glad that you asked. Hardscape refers to the "hard" more permanent areas of your backyard — so you'll definitely want to weigh all of the possibilities before you start breaking ground. The myriad of materials out there have given way to hardscaping designs to fit every budget and aesthetic. From modern, to rustic, to Scandinavian, to Mediterranean, and beyond, the options are limitless. But before you take the plunge, and make your final decision, check out these gorgeous hardscape design ideas that are guaranteed to inspire and get those creative juices flowing. 1. Don't be afraid to mix and match. 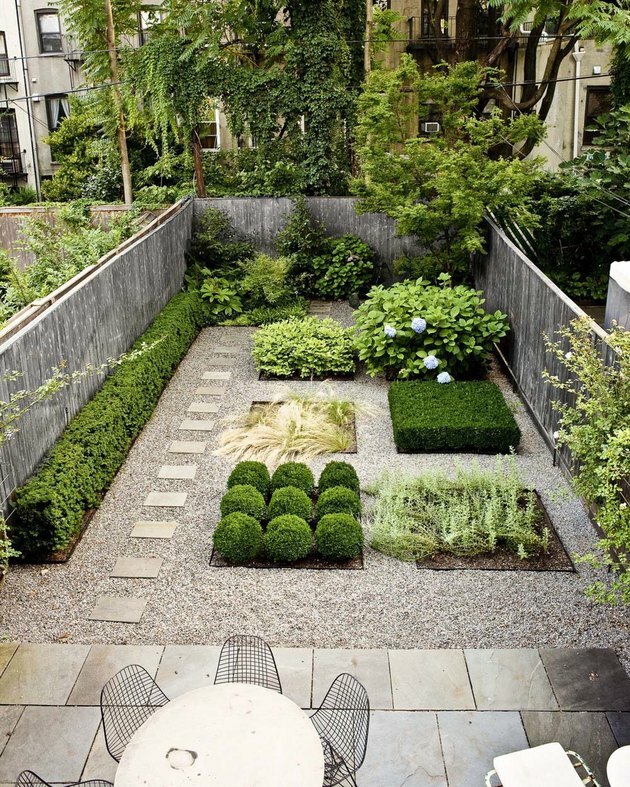 This backyard is a great example of a mixed-material hardscape design. 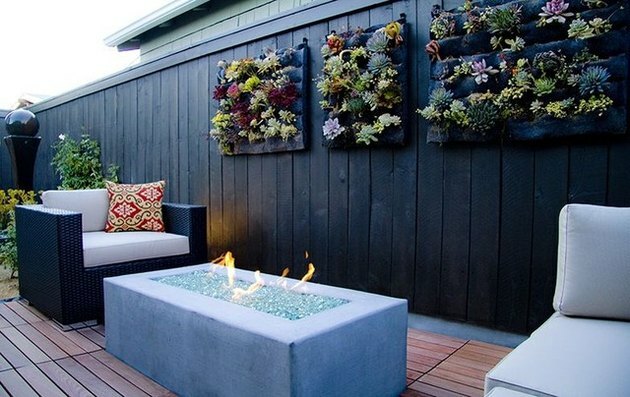 A perfectly balanced combination of wood plank fencing, grass landscape, concrete benches, a concrete planter, and fire pit give this outdoor space a rustic midcentury appeal. 2. Turn your backyard into an exotic oasis. 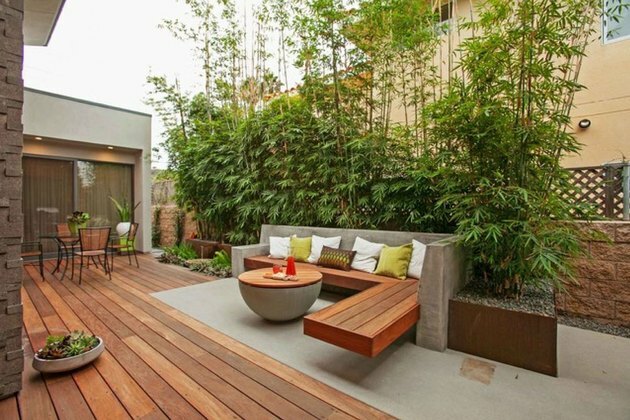 Concrete and wood are paired together to form the deck and built-in seating in this verdant backyard. A row of tall bamboo trees planted in gravel beds are added to soften this exotic oasis, while simultaneously adding privacy. 3. Blur the lines between hardscape with landscape. 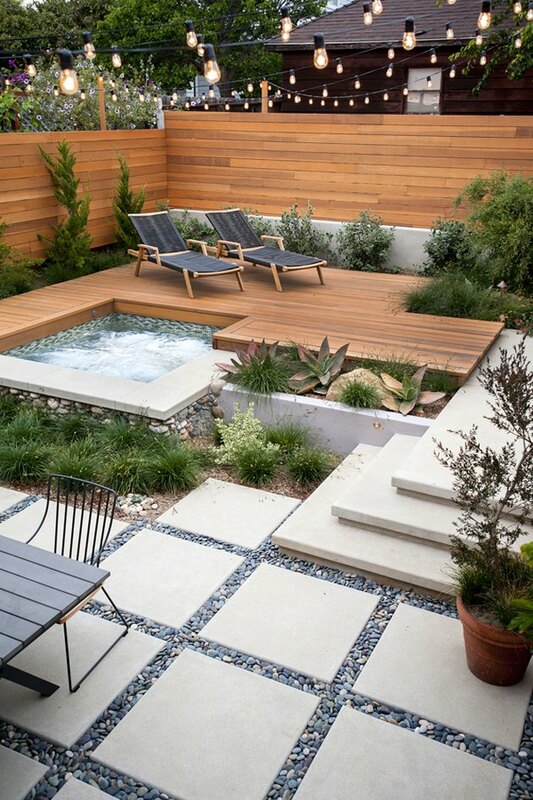 A simple yet brilliant design seamlessly blends hardscape and landscape to create a modern backyard paradise. 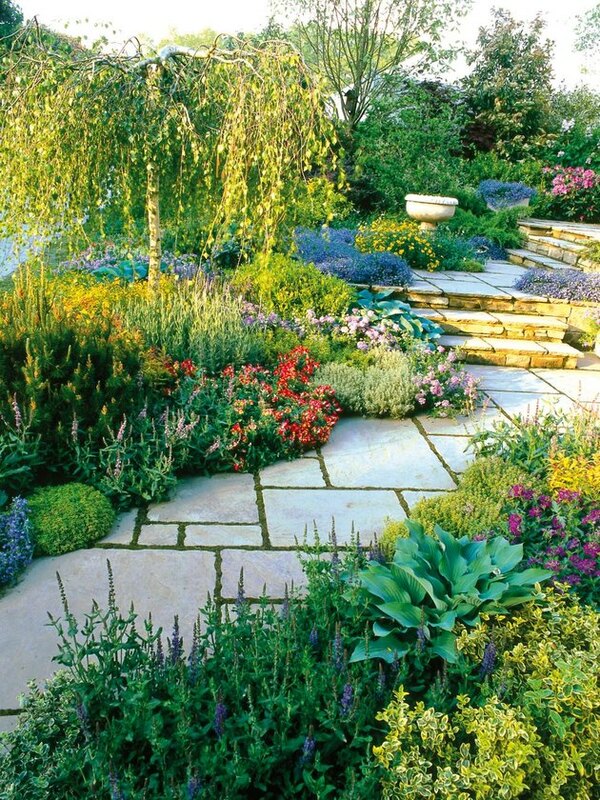 Verdant trees, shrubs, and flowers make up a beautiful garden leaving just enough room for a pathway made of stone tile with grass in between — it's like taking a walk in your very own park. 4. Opt for elegant traditionalism. 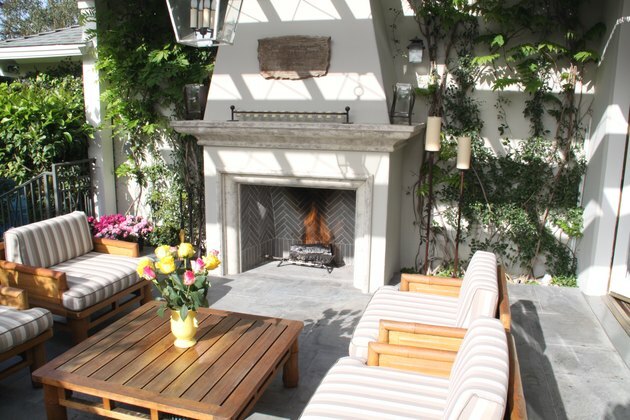 This concrete-heavy design is softened by vines of climbing ivy covering the walls on either side of the fireplace. The hardscape design centers around the stone fireplace, which along with candles and a rustic, glass-lantern pendant overhead offers warm and inviting lighting. 5. Be mindful of the existing architecture. The architecture of this Old World-style alcove plays a big part in the hardscape design. 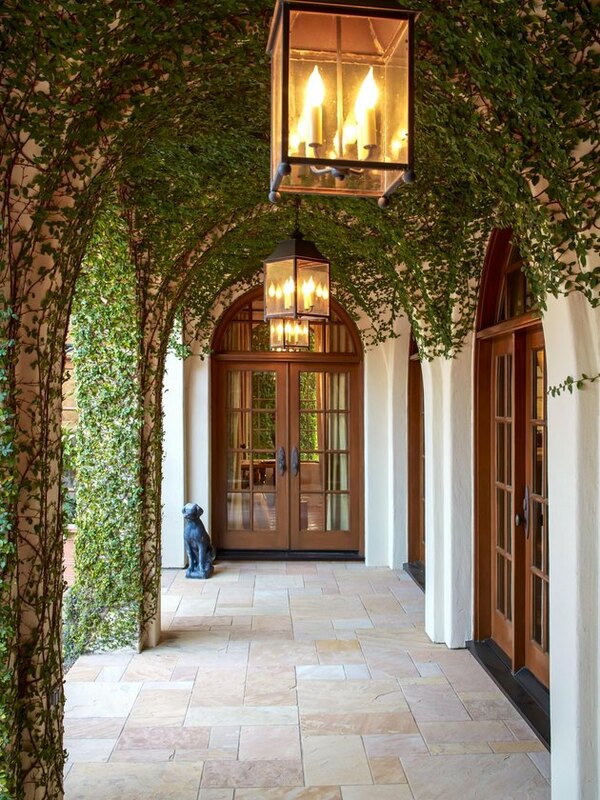 The climbing fig vines that follow the curved lines of the archways, the wood French doors, and the neutral stone patio all work together to transport you back to another time and place. 6. Wood decks and gardens go hand in hand. 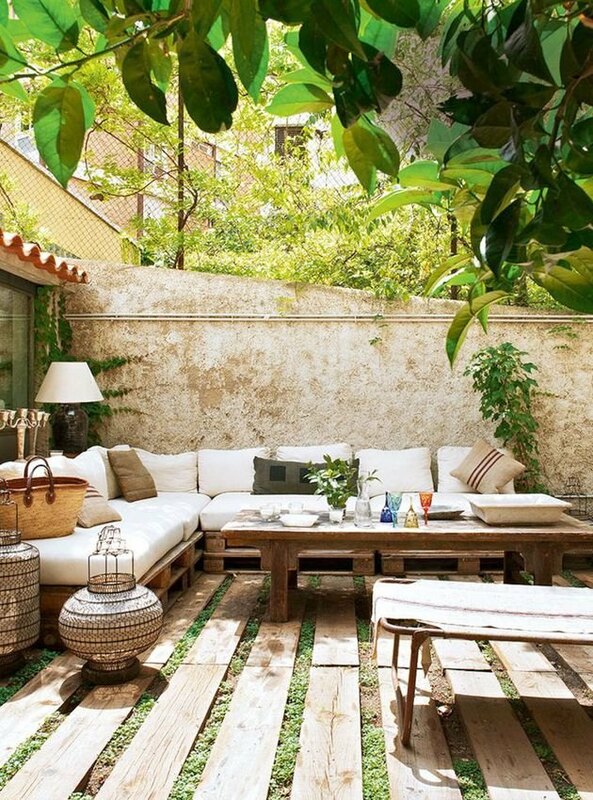 With greenery all around, the natural elements surrounding this wood deck create a pleasantly organic atmosphere. 7. Create your own bellisima Italian villa. 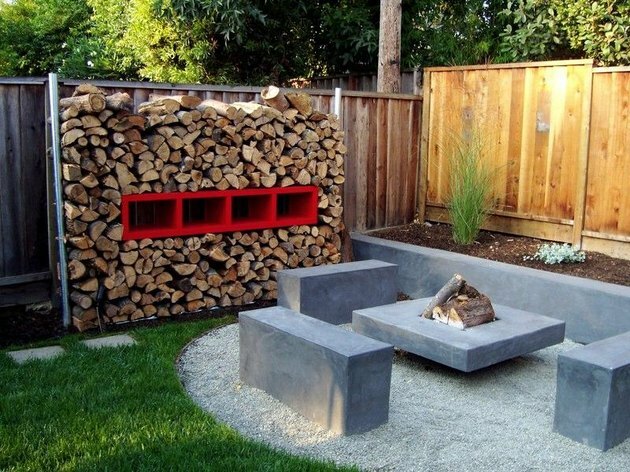 Unexpected yet aesthetically pleasing, this hardscape design features wooden planks placed right on top of the grass. Paired with a rustic sectional sofa and a few candle lanterns, this dreamy outdoor space almost looks like a villa in the Italian countryside. 8. Steel and concrete are are the perfect pair. The sleek, clean lines of this hardscape design steal the show in this modern backyard. 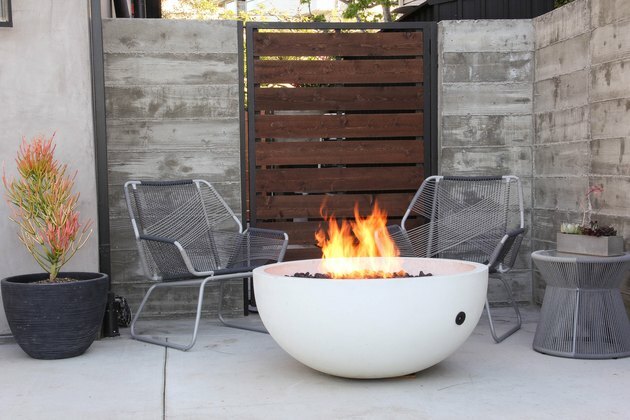 Edgy outdoor furniture including a large white fire pit round out this urban concrete jungle. 9. Enjoy desert-chic vibes all year long. Here's another hardscape design that transports you to a faraway land. 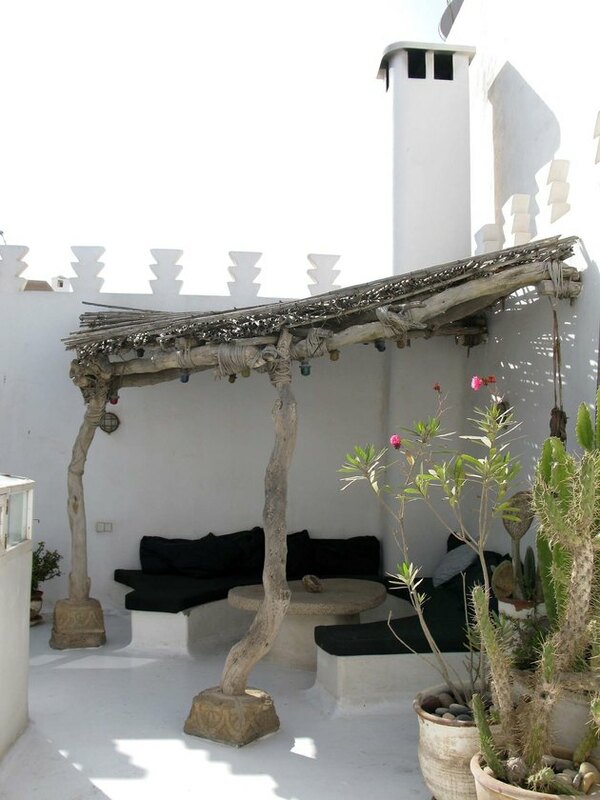 The built-in benches seem to almost grow out of the house, while the patio covering makes incredible use of natural materials. This ultra-modern playground is so much fun. 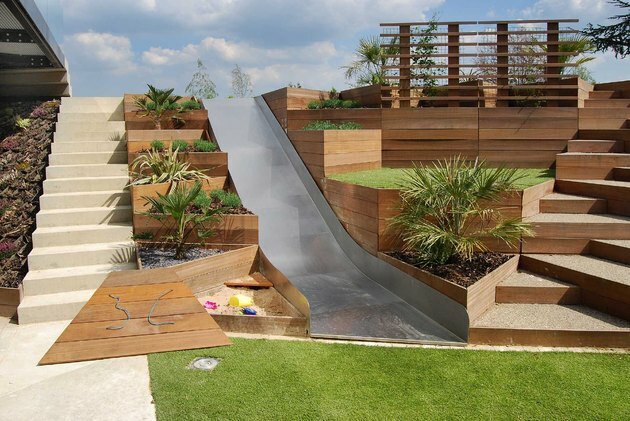 Not only does it incorporate a hidden sandbox, but it also features a slide! Two sets of stairs leading up — one made of stone, while the other combines wooden stair treads with gravel risers — give you easy access to the whimsical slide, with soft green grass below to gently receive you. 11. You can never go wrong with a little Southwestern flair. Here's a mixed-material hardscape design that incorporates a contemporary take on Southwestern landscaping. 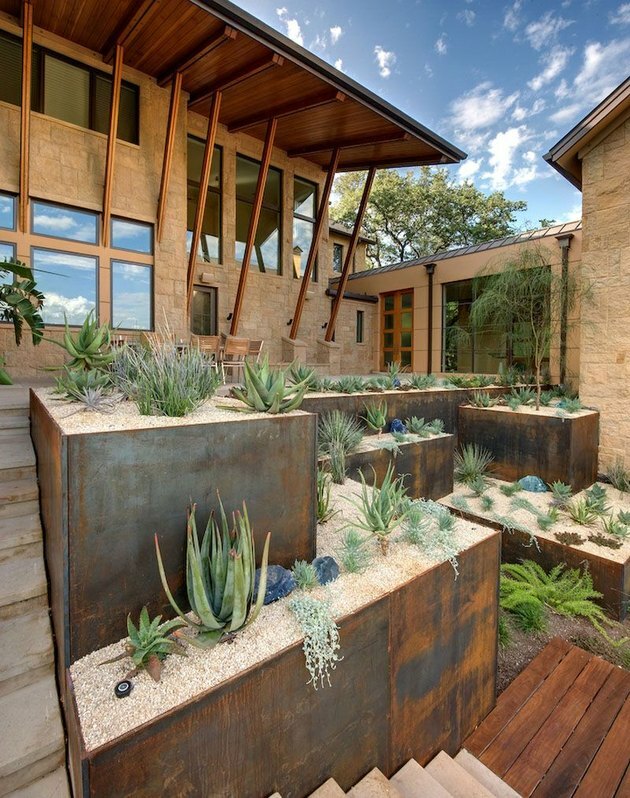 Rusted metal borders form multiple levels of loose-gravel rock gardens filled with a variety of low-water desert plants. 12. Stay calm with a zen garden. 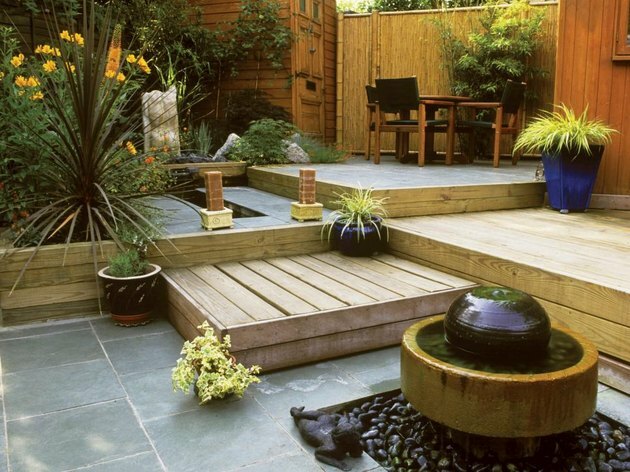 This backyard uses hardscape materials to create a Japanese zen garden. The multi-level decks alternate stone tile with wood flooring, separated by wood plank borders. 13. French country gardens are so charming. This French country-inspired backyard is giving the gardens of Versailles a run for their money. Okay, that might be a stretch, but we think this hardscape design is very ooh la la! By using loose gravel, a few stone tiles, and some geometric gardening, this gorgeous outdoor space imbues an elegant grandeur.